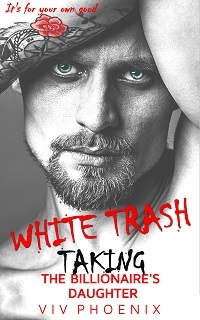 The bad hero trend in romance sparked White Trash. Watching hitmen, stalkers, abductors, and serial killers top the charts got me musing on twisted attractions. I delved into social media stalking cases when I started it. I was tempted to add an author’s note to explain my intention with this book. I read and write a lot of dark material, yet this one is disturbing, even for me. I decided a note would be a cop-out, so I settled for strong warnings. I don’t usually go so far to keep people from reading a book. As much as I like to move people, and despite a sadistic streak, I’m not out to upset anyone. So, we have here a mesh of dark instalove, captive woman romance, and crime fiction. Have I mentioned lately I’m a horror writer? This is a dirty book, and it’s intense. Aside from the gooshy bits and the way the book edges into harsh reality, the book gets personal. Growing up in my family, one of the worst things anyone could call you was white trash. Living in a weird blend of privilege in poverty left me with a class schizophrenia that marked me forever. In a weird way, writing White Trash was freeing. When you go into old wounds, sometimes it’s possible to take away their power. There’s a strange reclaiming in this book. I’m grateful to Kindle Junkies for a thoughtful first review. I expected to get roasted for this one. It would mean a lot to me if you would take the time to write a review, even a short one. Early reviews help a book a lot. And having a few good ones could keep the book from getting a bad overall rating. Living on what I make writing fiction while I travel is one of the most nerve-wracking things I’ve done. I’m leaving the Yucatan for Costa Rica next week. Moving disrupts my writing, so I’m doing as much as I can before I go. Thank you for all your support. On rough days, when the months of traveling alone start getting to me, I read your reviews and they give me a lift. In keeping with fair use, I limit my use of reviews to brief quotes. You can see the full reviews on the book’s Amazon.com page. That’s the U.S. site. I hope you get a thrill out of White Trash. Enjoy!